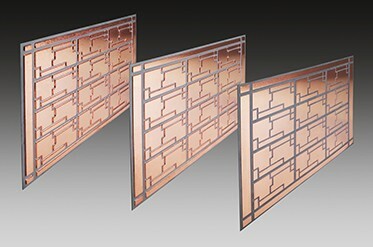 These insulating heat dissipation substrates combine a copper circuit with silicon nitride, one of the world's best ceramic materials for heat dissipation and strength. The body of the substrate is made from strong ceramic material and the copper circuit can be between 0.1mm and 0.8mm thick. Silicon nitride's heat dissipation property makes it a key material for making more compact power modules with higher output. It also has an outstanding heat resistance cycle, resulting in a long life and high reliability in substrates. This makes it well suited to a wide range of structures in power modules, such as ultrasonic joining of copper electrode terminals, elimination of copper bases and drilled holes for screws. 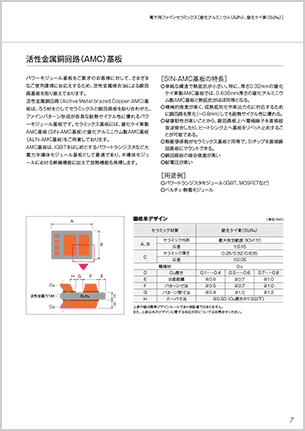 In our AMC (active metal copper circuit) substrates, the copper circuit is joined to the ceramic material with a brazing material in between. This makes it easy to create fine patterns, and produces power module substrates with outstanding heat resistance and cost effectiveness. Our aluminum nitride ceramic substrates with thin metallized film are among the world's best for heat dissipation. 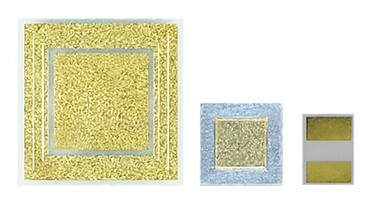 Our range includes thin titanium, platinum and gold film, gold tin soldering of patterns and sub-mounting with gold bumps. 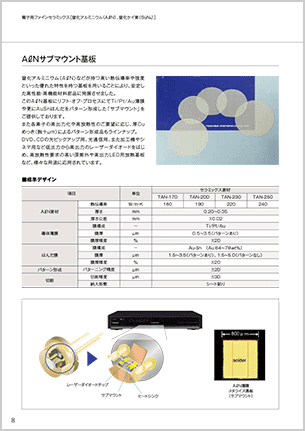 These substrates are used in a wide range of fields from laser diodes to LEDs for general lighting, high-power LEDs for headlights and deep UV LEDs that are currently in demand for purposes such as sterilization lamps and resin hardening lamps due to their high heat dissipation.